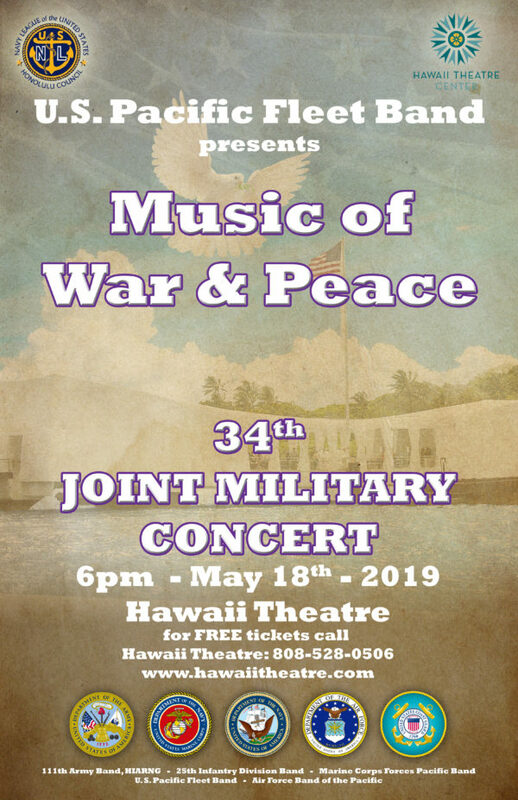 The United States Air Force Band of the Pacific is proud to present the 34th Annual Joint Military Concert at the historic Hawaii Theatre on Saturday, May 18 at 6:00 PM. Admission is free and will feature a joint performance by members of the Army 25th Infantry Division Band, the Hawaii Army National Guard Band, the Marine Corps Forces Pacific Band, the Navy U.S. Pacific Fleet Band and the Air Force Band of the Pacific. The concert is open to the public; free tickets for this event can be printed at home by going to www.hawaiitheatre.com. For additional ticket information, please visit the Hawaii Theatre Box Office, located downtown at 1130 Bethel Street, or call (808) 528-0506. Emceed by local TV/radio personality, Howard Dicus, the afternoon will feature a diverse repertoire that celebrates the patriotic spirit of the American People, and will pay tribute to our active duty, guard, reserve, contracted civilians, and veterans, as well as spotlight the important role families and friends have in support of their service member. The United States Air Force Band of the Pacific, under the command of Lieutenant Colonel Cristina Moore Urrutia, is the lead organization for this year’s concert, which will feature representatives from all the service bands stationed on Oahu. The Joint Military Concert is now in its 34th year, and has a long standing tradition of highlighting the importance of the interoperability of our nation’s armed forces as well as recognizing May as National Military Appreciation Month. The concert, entitled “Letters From Home,” will be presented as a variety show, and will feature various ensembles, performing country, rock, classical, jazz, ceremonial and patriotic music. Tickets are available online, or from the Hawaii Theatre box office. The event is free to the public. Public, general admission seating for ticket holders will begin at 5:00 PM. Those without tickets will be admitted just prior to the event, depending upon available seating. Ticket and event information is available from the Hawaii Theatre box office located Downtown at 1130 Bethel Street (between Hotel and Pauahi Streets) during regular box office hours; Tuesday through Saturday, 9:00 AM to 5:00 PM. You may call the Hawaii Theatre box office for additional information at (808) 528-0506 or visit www.hawaiitheatre.com .